The Annual Autumn Fund Drive for Gilford’s historical society was set in motion on September 16th, the occasion of its “Heritage Festival Day”. A money thermometer on display in Gilford Village indicates this autumn’s fund-drive goal to be $10,000. Gilford’s historical society, the Thompson-Ames Historical Society, is a 501(C)(3) not-for-profit organization that looks to the public for charitable support, with donations being tax-deductible. Financial support gained through fund raising provides the historical society with funds necessary to maintain its museum buildings, address display needs, and provide programs, including field-trip experiences for youngsters in the Gilford schools. During the past ten years, public support has enabled T-AHS to make great strides in addressing museum-building needs, creating theme displays for the many and varied collections, providing a meaningful website, and enhancing the society’s ability to make its artifacts and archival materials more accessible to the public -- all these being efforts to preserve and spot-light Gilford’s historical heritage. These items, which had been on T-AHS’s “wish list” for some time (in some cases ten years! ), surfaced this year as top priorities. It has long been recognized that preserving a community’s history is essential to the community’s well being. The historical society is the vehicle that has as its goal the preservation of local history, which is then made accessible to the public. It is the historical society that people look to as an opportunity to volunteer their time in not only “preservation” but also “knowledge-sharing” efforts; Gilford’s historical society logs upward of 4,000 volunteer hours annually. Volunteer efforts coupled with financial donations enable the historical society to preserve and share the community’s history -- within the community, in respect to its adults and children, as well as to outsiders who come to visit or contemplate becoming part of the community. Well wishers who would like to make a financial donation, as well as those who would like to volunteer their time, can contact Gilford’s Thompson-Ames Historical Society by mail sent to P.O. Box 7404, Gilford, NH 03247-7404. 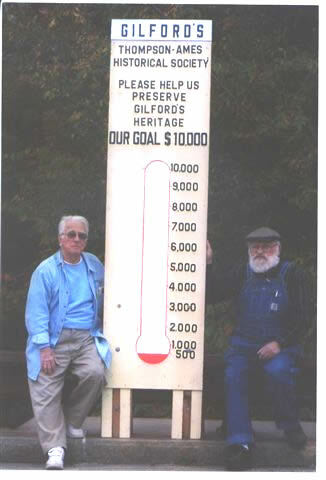 Do keep an eye on T-AHS’s fund-raising thermometer in Gilford Village and watch as your and your neighbors’ donations make the mercury rise, reflective of warm support for the efforts of Gilford’s historical society to preserve Gilford’s historical heritage.